If you’re looking for a way to efficiently, effectively heat concrete floors, In-slab radiant heat cable is much less expensive than hydronic radiant heat and much more effective. Designed for installation in new concrete slab applications, this cable can heat a variety of surfaces quickly, from carpet to tile, hardwood and more. By its very nature, in-slab heat systems require less upfront investment, are much easier to install and feature much quicker response times. Consider hydronic systems–they’ve been around the longest, and are definitely a reliable source of heat. However, these systems rely on a boiler and a network of pex tubing to heat concrete surfaces, making their installation and configuration much more labor and cash intensive. A boiler is also required to heat the water first, before pumping it through a series of pex tubes embedded in the concrete, resulting in a significant pause before the water is warm enough to generate any heat. Conversely, In-slab radiant heat cables are controlled by a technologically advanced, easy-to-used thermostat with a built in GFCI and an in-floor sensor. And radiant heat cables do not share the same rigidity in design and installation as hydronic Pex tubing does. Extremely bendable, electric radiant heating cable can be bent to fit into tight spots and can be installed to fit the most challenging spaces. Once installed, a turn (or pre-programming) of the thermostat dial allows the system to generate heat within just a few minutes. Durable, rugged and waterproof, In-slab heating cable is designed to work under a variety of surfaces, wet or dry. The cable produces 10-15 watts per square foot of concrete surface, making it equally perfect for small, custom, residential applications and large commercial jobs. Quick activation times and heat storage within the concrete slab also end up saving you money in the long run. The In-Slab heating system is one of the most efficient floor heating systems available. If you’re a do-it-yourselfer, choosing electric radiant heat over a hydronic system can also save you some hand-wringing and a few bucks to boot. Laying out of series of Pex tubing for a hydronic system requires some serious planning and coordination as the pipes are assembled, connected and sealed. In addition to In-Slab heat cable that is provided on spools, floor heating cable is also available in easy-to-roll-out mats that can be installed directly under the flooring. 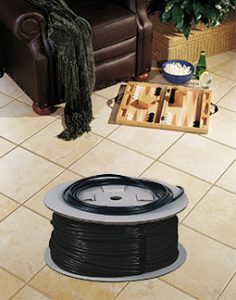 Visit Warmzone’s ComfortTile floor heating web pages to learn more about this electric radiant heat cable that can be purchased right off of the spool or in pre-configured mats. It’s another industry leading floor heating solution that can be used to heat a variety of floor surfaces. Contemplating an electric radiant floor heating system? Be sure to contact Warmzone for more information on the benefits of In-slab and ComfortTile radiant heat cable at 888.488.9276. Heated floors and heated driveways can take a very little time to coordinate and install with the right company behind you. Warmzone can take all of the guesswork out of your installation with one simple phone call, so you can get back to boating or barbecuing. What makes Warmzone your best bet for radiant heat installation? They offer a vast selection of premiere products at very competitive prices, along with deep industry knowledge, allowing them to quickly assess your needs to deliver the perfection radiant heat system for you. In addition to offering the highest quality radiant heat products, you’ll get unmatched customer service and complete design and engineering services. 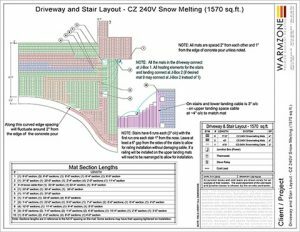 Unlike your typical big box one-size-fits-all solutions, Warmzone custom designs radiant heated driveways, heated floors, and roof deicing systems to ensure they meet each project’s specific needs. Warmzone understands that regardless of the quality of your system components, a radiant heating system is only as good as its installation. In addition to Warmzone’s personal installation support services, you’ll receive a computer-aided professional system design, giving you all of the specs, from power needs to performance expectations including load calculations, and breaker sizes. Warmzone’s complementary engineering and design services have set the industry’s gold standard when it comes to accurate, professional system layouts. These technical drawings minimize any issues you may encounter by providing you with all the necessary information prior to any installation taking place. This saves you the time and helps to ensure that your system is installed correctly and performing as advertised. No matter what your requirements, Warmzone has the experience and expertise to deliver whatever you dare to dream up, whether it be a basic design or custom patio, walkway and steps scribbled on a cocktail napkin over lunch. If you’re not sure what the best solution for your project is, Warmzone can show you the many custom options that are available and walk you through the process from conception to completion. With free quote services, they’re often a good place to start your research, and often the logical place most consumers return to after they’ve shopped around. Warmzone’s dedicated installation support personnel are available to assist you should you have any questions during the installation process. Warmzone also offers free installation training for installers. You won’t find a more dedicated, knowledgeable and helpful staff than that of Warmzone. At Warmzone, competence and quality win the day, every time. For more information on Warmzone’s system design and engineering services, call888.488.9276.